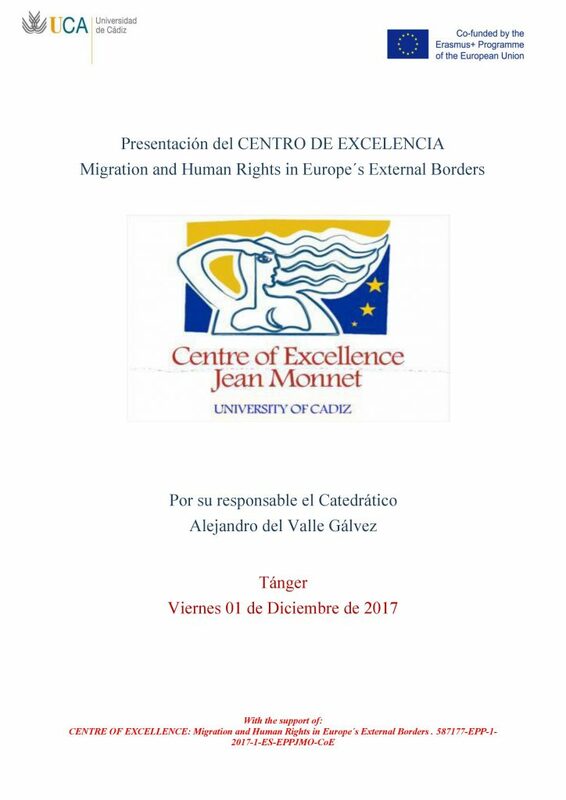 The Centre of Excellence “IMMIGRATION AND HUMAN RIGHTS IN EUROPEAN EXTERNAL FRONTIERS” was presented in Tangiers on the 1st of December 2017 by its director Professor Alejandro del Valle, with the participation of the members of the Research Group of the “Observatoires d’Etudes Méditerranéennes” of the Abdelmalek Essaidi University, appointed by Professor Rachid El Houdaigui. The Centre of Excellence, awarded by the European Commission for the period 2017-2020 to the Area of Public International Law and International Relations, is directed by the Professor of the University of Cadiz Dr. Alejandro del Valle Gálvez, and is one of the 15 centres awarded by the European Union worldwide. During the celebration of the event in Tangier, the objectives of the Centre were presented, on the one hand, which aims to be a European and trans-national Centre for training, research and dissemination on issues of Immigration, Borders and Human Rights, with intense projection in the border area of the University of Cadiz itself. On the other hand, the activities that will be developed by the Centre of Excellence and in which the Abdelmalek Essaidi University will participate have been discussed. The Areas of International Law and International Relations of the University of Cadiz and its counterpart the University Abdelmalek Essaidi, have been developing joint activities since 2003, in the form of seminars, congresses, research, among others. In addition to the publication of the joint electronic journal Paix et Sécurité Internationales.